By Xah Lee. Date: 2017-07-03 . Last updated: 2017-09-02 . 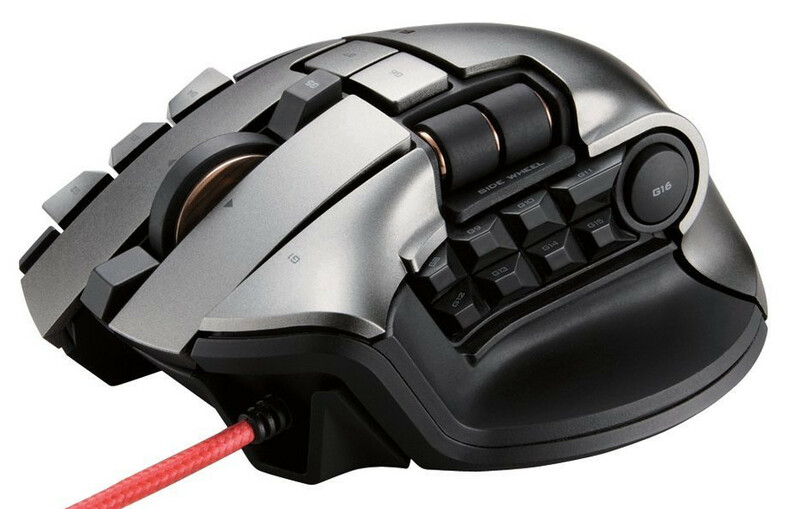 This mouse came out in 2016, from Japan. It has amazing features, never seen on a mouse before. It is a “DUX” MMO gaming mouse with a wireless receiver that can connect a mouse wired and wirelessly to two separate personal computers and operate them simultaneously. Useful for operations of 2 characters, simultaneous play of two games, operation of capture site display.The side scrollable tilt wheel and the side wheel operated by turning sideways are carried. Assignable preference function to 25 places with 19 buttons and 2 wheels. Functions can be registered separately for each button on the main PC and sub PC, and complicated operations can be realized. Onboard memory that can save 5 button settings and 4 DPI settings in the mouse body is carried. It responds accurately to the speed of up to 130 inches / second and acceleration of 30 G, and it is possible to operate the cursor according to the image. This thing is quite amazing. There's not much info in English yet.